Last Saturday, the eyes of the racing world were turned towards Baltimore, where Bob Baffert’s Lookin at Lucky reversed his racing fortunes with a Preakness win. About 600 miles to the west, another Lucky was hanging out in a paddock, eating peppermints, and reveling in retirement. Lucky to Cope is an 8-year-old bay gelding; by Lucky Lionel out of Copenqueen, he’s got champions on both sides of his pedigree, in Blushing Groom and Susan’s Girl. His own racing career was a little less impressive than those of his esteemed progenitors; racing 64 times with four wins, the Florida-bred stayed mostly close to him, racing on the Calder/Gulfstream/Tampa circuit. In February of 2007, I was at simulcasting at the Meadowlands, awaiting my brother’s surprise party there that night; in some mid-card turf race from Gulfstream, my eye kept going to a 35 – 1 shot; I couldn’t figure out why I liked him, but I did, and I stopped trying to talk myself off him when my friend Pete, a far better handicapper than I, said, “I kinda like the 2 here.” Shocked, I said, “Me, too,” and off we go to the machine to bet…and back we went to collect when the 2 hit the wire first, handing us a $72 winner. That horse was Lucky to Cope. I put him in my watch list, and observed from afar as he raced in mostly claiming and low-level allowance races; I didn’t usually bet him when I saw him entered, which I regretted when, in July of 2008, Lucky to Cope uncorked another winner, this one at Delaware Park, paying $60. He could have been had for $5,000. Lucky to Cope raced for another year and a half, finishing his career last November in a claiming race at Finger Lakes in which he finished behind every starter except for the one that threw its rider. The entry notifications stopped coming, and Lucky to Cope slipped out of my racing sight. Lucky got listed on the Finger Lakes Thoroughbred Adoption Trainer Sales page and last December he moved to Michigan…I bought him with an eye to making him a foxhunter, but so far his disposition…suggests he harbors a secret ambition to be a Western pleasure pony. He’s currently sharing a pasture …and acting like a martyr if I suggest we MIGHT try thinking about a canter today. (“I’m RETIRED. Retired means sitting on the beach drinking mai tais, not WORKING.”). Jennifer Quail, Lucky’s new owner, had typed his name into a search engine and landed at my post last summer about the horse. An educator at the Museum at Southwestern Michigan College, she’s been riding since she was six years old, and after going to grad school and living in New England for a time, she returned to Michigan, where, she said, she could finally afford to have a horse again. A member of the forum at the Chronicle of the Horse, Jennifer knew that Finger Lakes needed to move a number of horses when the meet ended there last fall. Lucky to Cope was listed on the adoption page of the Finger Lakes Thoroughbred Adoption Program and garnered strong recommendations from volunteers who knew him, and from his trainer, Jared Schoeneman. Sight unseen, she bought him for $600 and shipped him west. 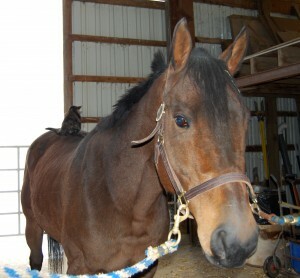 Jennifer bought Lucky, as she calls him, to train him to be a fox hunter. He’s not all that keen, she says, to lean on the bit, and she’s learning with him, figuring out what he likes to do. For now, she’s riding him in English tack and has him stepping over poles. He’s not ready to jump, and he’s not aggressive at all. “You could put a little kid on him,” she says. Or, apparently, a kitten. Lucky to Cope’s got his own blog now; Jennifer updates it regularly with tales of his training and his adjustment to retired life. He’d be happy, she says, to stand in the paddock and eat peppermints all day. After 64 starts, Lucky is sound and ready for a second career. He earned $94,974 in his racing career; none of that money has directly contributed to his retirement. According to the FLTAP website, Finger Lakes Gaming and Racing is the first Thoroughbred racetrack in the United States to open an in-house adoption program, dedicated to the retraining and adoption of its retired racehorses, the first Thoroughbred adoption facility in the country that’s a collaborative effort between racetrack management and horsemen. Quail says that last year, FLTAP adopted 92 horses through its trainer listings. She can’t speak highly enough of the Finger Lakes adoption program and of Schoeneman, who listed Lucky to Cope for adoption. So because of his trainer’s compassion and foresight, and because of the good work of FLTAP, Lucky to Cope is living the good life in western Michigan. Another Lucky won the big race last weekend…but this Lucky’s got his own brand of good fortune, and it has nothing to do with the winner’s circle. What a great story. I love happy endings! Enjoy your retirement Lucky, you’ve earned it. I will say Lucky is QUITE happy that the pest seems to have outgrown her kitten phase of using him as a jungle gym. PS. I guess you heard the famous Arrrrr has also been retired to a new life, here’s his blog.. So nice to know he’s got a home–everyone should have an OTTB in the backyard. I hadn’t heard about Arrr–thanks for passing it on! Poor kitten named “Pest” is just living up to her name! Arrrrr is living the life of Riley, as they say! He has TOTALLY adjusted to being the love of his girl’s life. He was adopted by someone from ABR. Excited to see Arrrrr has a blog, as well. Retired Racehorses take the InterWeb!! Thanks so much, Teresa, for a wonderful and heart warming post. I’m so glad that this “Lucky” was lucky as well! Absolutely, Natalie–cats and horses, and you got me. Elizabeth, I was thrilled to hear from Jennifer last week. I still sort of can’t believe that I know where this guy ended up. It’s so nice to know that there are some “lucky” horses who find people who truly want them & can provide for them. Thanks for writing these stories, Teresa.